It wasn't all that long ago when I was raving about this budget friendly concealer in my Most Loved post. So, I've been using Maybelline Pure Mineral Concealer for almost a year now and safe to say that it is my holy grail drugstore concealer for hiding my dark circles. Holy Grail. There I said it. Yes, it's THAT good. I discovered this wonderful product from my mum as she has been using it since forever. It has a liquid consistency but not runny and it feels so much lighter than the cult beauty favourite, Collection Lasting Perfection Concealer (Well, I just have to compare!). I have been really liking the consistency since I can take my time to blend it with my finger or damp beauty blender and I'd say that both techniques give me better coverage than blending it out with brushes. Maybelline Pure Mineral Concealer comes in tube packaging with a typical doefoot applicator. The wordings on it's packaging are mostly printed in Japanese to which I couldn't read, but it does say oil and fragrance free. It has a plastic-ish scent to it but not too overwhelming. 5.5 ml of products is what you'll be getting inside the tube, tak banyak but still berbaloi kot? I got two shades of concealer in 01 and 02 - these are basically just the two shades available. 01 leans toward the yellow shade - probably NC 20 for comparison while 02 is very orange-ish. 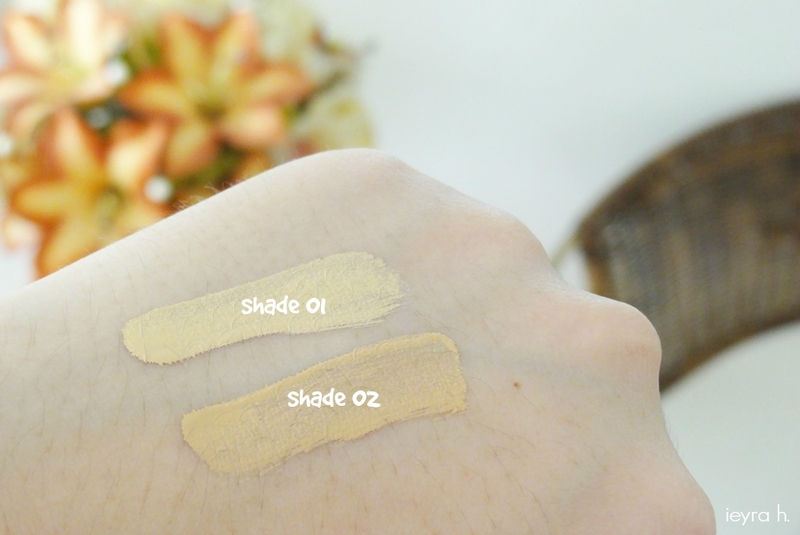 Both shades are great but I'd recommend getting the shade 02 if you have very dark under eyes circle, like me *so unfortunate* D: Peachy or salmon-ny tinted concealer helps to conceal the blue-ish part of your eyes (sila ingat kembali warna oren dan biru bertentangan to each others in the roda warna - FORM 1, Pendidikan Seni Visual, LOL). You can still use it to conceal blemishes and pimples but it's not something I'd recommend since it's not thick enough like Collection Concealer (again, I just need to compare haha). On me, it stays put for at least 5 hours with proper set. If I don't prep my face properly or when my under eyes area are extremely dry, I only get up to 3 hours. So yes, this concealer does crease. I also have to say that the concealer seems to set into fine lines. BUT OH WELL, IMMA BEING BIAS HERE, this is the ONLY liquid concealer from the drugstore I've tried so far that able to fully conceal the dark circles so that I will look more alive. Bubz from Bubzbeauty also included this product into her Top 5 Concealers Video and according to her, Maybelline Pure Mineral Concealer is the dupe for Shu Uemura Concealer. I also heard the consistency is somewhat similar to MAC Select Moisture Concealer. On the Website : Oil Free and Fragrance Free concealer that doesn't clogs pores which provides all day natural coverage. Micro-Minerals fully conceal imperfections and under-eye darkness, leaving you with natural flawless, healthy looking skin. Direction - Using applicator, apply concealer only on areas that needs to be concealed, then tap the concealer on face using ring finger. Availability (Malaysia) : Major pharmacies and stores. I bought mine at Watsons and Tesco. Now tell me what's your favourite under eyes concealer? As always, thank you so much for reading! It is so difficult to find matching concealer shades for darker skins at the Malaysian drugstores. I wanted to grab this too but the shade options were simply too light! Couldn't agree more! My sister has a deeper skin tone and it's pretty hard for her to find darker shades of base products. Have you tried anything from Lakme? Yes I have. But even Lakme doesn't do a proper shade range (for those products available in Malaysia at least. I only have access to the Lakme in Mathavon Stores in Penang and some of those Indian Cash and Carry shops around. Even they carry like 3 or 4 shades at most, here in Penang at least (the line with the deeper shades are either not available here, too expensive for a drugstore brand or out of stock). I think, in terms of drugstore brands, only Revlon has the widest shade selection.